Adames is on the Rockies' Opening Day roster, Patrick Saunders of The Denver Post reports. He seemed to be on the outside looking in for a roster spot toward the end of Cactus League play, but with the demotion of prospect Jordan Patterson, Adames will get the opportunity to suit up for Colorado's opener in Milwaukee. 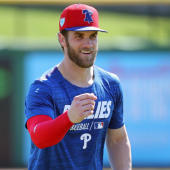 He isn't tabbed for too much playing time and doesn't have great stats at the major-league level to increase his stock, but he recently added first base to his defensive repertoire and could see most of his action as a late-game defensive replacement.